A chamomile-infused soap was one of the first soaps that I made, and it is still one of my favorite simple soaps to make! This soap is infused 3 ways with chamomile; using chamomile-infused olive oil, chamomile tea, and chamomile extract. For this recipe, I used 92% chamomile-infused olive oil and 8% castor oil for gentle bubbles. I used chamomile tea in place of water, and I added chamomile extract after the cook. To prepare my chamomile-infused oil, I poured 1 litre of olive oil + 50 grams of dried chamomile flowers into my crockpot and let it simmer on low for 2 hours (I infuse more olive oil than I will need, because some of the oil gets absorbed by the chamomile flowers). Then, I let the infusion cool and strain the olive oil really well through cheesecloth. I absolutely adore the process of infusing chamomile, the fragrance is so apple-y and calming; unfortunately the natural scent of chamomile does not last long in soap, so sometimes I add a small amount of chamomile fragrance to lightly scent it. 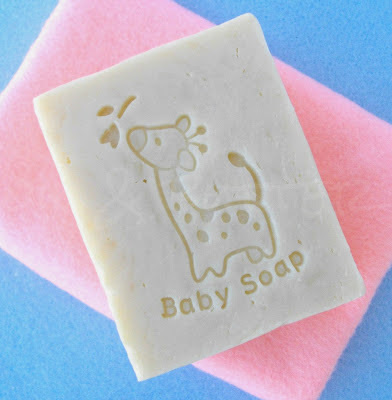 Oh, and I recently treated myself to this new baby soap stamp from Brambleberry, how cute is it?! That stamp is adorable! My mom is across the room and saw this photo while I was reading, and squeeled over it haha. Awww, lol! Brambleberry has so many cute ones, I had a hard time deciding on only two! Your chamomile soap sounds wonderful, Cee Gee! I haven't tried infusing oils with herbs, but I am intrigued by the process. And your soap stamp is so cute! Thanks Jenny! Infusing the oil is actually super easy, and it adds really nice quality to the soap!